Learning Dive Theory has never been more convenient! What does Dive Theory Online cover? What is Dive Theory Online? Dive Theory Online gives a comprehensive overview of dive physics, dive physiology, dive skills, environmental considerations, dive equipment specifics and decompression theory & the RDP. Each section consists of multi-media instructional sections followed by study questions. End-of-section assessments verify eLearner mastery of each section. What isn't Dive Theory Online? Dive Theory Online is not a substitute for any required materials. All PADI Divemaster candidates are still required to own a personal copy of the DM manual, DM slates, Instructor Manual, Diving Knowledge Workbook, and Encyclopedia of Recreational Diving. 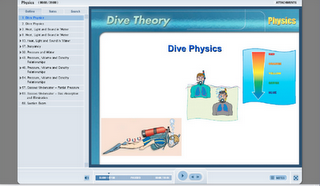 Dive Theory online is supplemental study material. Dive Theory Online is not a prerequisite for professional-level PADI courses. It is optional study material. Dive Theory Online is not a substitute for Divemaster exams, or any other candidate exam. Payment is made to PADI for eLearning via a secure online payment system.